Just thought I'd say happy Easter to everyone who is celebrating Easter this weekend! Happy Easter as well - though it looks like being rather a wintry one - snow is even forecast. Never mind, I'm just finishing off the last bits of urgent work and then close down for the break. I have promised myself that tomorrow I will sit down and enjoy myself going through all the clips that Ray has recently posted on his web-site and take my mind off the horrible weather outside. Isn´t a little bit early guys to celebrate Pasxa? Don´t forget This is an Orthodox site. Mhh!!! whatever. So, HAPPY EASTER to everyone - and remember us again next month when Easter hits Greece, OK? 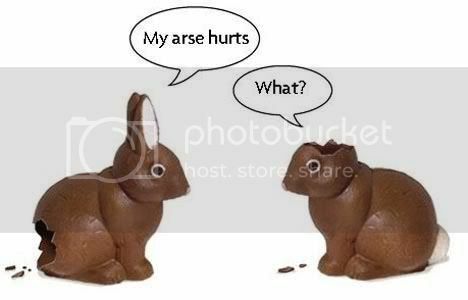 Haha Wim, Iam not eating anymore bunnie choco after this!! Hei Dinny whats going on with the new road from Pitsidia to Matala? Ive heard they chopped off all the trees? Would you be kind enough to take a picture or two and post them on this site? Does it mean that we can run now to Matala and back from Pitsidia without bouncing on cars? Ton, I have to whisper so that nobody will notice the small diversion of the original thread: Yes, they have chopped all the trees on the road to Matala, but I fear it will not mean that you can run all the way through to Matala, the freed space is apparently destinated for parking cars! Sigh! I cannot take a photo to post here, the only digital camera I had was the one in my cell phone, and that one has been out of order for months - am not missing it at all though! Ssshhh. !!! Happy gone Easter Happy new coming Orthodox Easter. Would that do it Dinny? Thanks for the feed back. Parking Cars??? Who on earth wants to park his car on this road except the people who stop to take a pis...The last one who did this got killed by a car last year. They should put signs such as' if you want to take a leak.. cross the road at your own risk'. Happy easter!! I had Lamb and Horta last Sunday and watched a Disney movie with Tom and Jerry.